It's back to school time, parents feel free to celebrate. Now with that done you may have noticed your teenage limping and complaining about their knee after practice or gym. If not great, if so listen up. For some teenagers, starting in the early teens they develop this sharp, painful and limiting knee pain without injury. You take them in and the doctor blurts out “Osgood-Schlatters.” And you then try to pronounce it, after a few attempts you manage to say it correctly but have no idea what it means. So what is going on with your teenager? Well, it’s no secret that children and teens are going through rapid growth, and when it comes to the body, muscles grow faster than bone. Teenagers involved in sports and athletics can develop their muscle strength faster than what the bone can keep up with. The primary muscle here is the Quadriceps, the large muscles on the front of the thigh responsible for straightening the knee, lifting the leg, lifting the body if the feet are planted, jumping, etc... 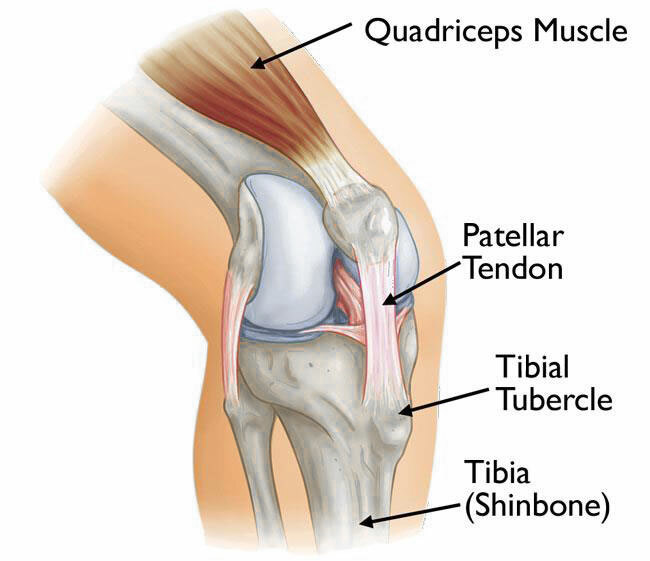 This muscle attaches first to the knee cap, and from there a ligament connects that to the front of the tibia or lower leg bone just below the knee. It’s at this point that Osgood-Schlatters occurs; appearing as a swollen bump that is very sensitive to pressure and impact (this can bring you to the ground if struck with even mild force). Pain can occur when climbing stairs, jumping, running, and squatting. Mild cases involve inflammation and swelling at the sight of attachment to the bone, usually lasting no more than a couple months. More advanced cases this can become an avulsion fracture of the bone where the muscle strength itself over time has caused the bone to start to separate from itself as the point of attachment is a growth plate; this stage can last years and will only resolve until the fracture heals and the growth plate has completely calcified. It’s important to identify and treat this condition early on before it progresses. So what can be done? First and foremost, stretching. Increasing flexibility of the quads and also stretching of the hamstrings is very important because it will decrease stress applied to the area of pain. Light strength training for mild to moderate cases can help by improving knee stability and range of motion. Rest and time is important because a teenager’s muscles can literally heal overnight they can pack on a lot of strength in a short amount of time, in severe cases taking the kid out of sports is advised to allow the body time to catch up and repair. Strapping/taping can be used under the knee cap in order to reduce the stress being applied to the point of ligament attachment. Icing in 5 minute intervals can help improve blood flow and promote healing of the region. In the most extreme cases of full avulsion fracturing of the bone, surgery may be recommended.